If an audio signal starts with a long stretch of silence, or there are long or short gaps of silence between sounds in a long signal, it can sometimes cause problems if it is used as a raw Guide or Dub signal. Obviously, these silences can be edited out of the signal before it is processed in the DAW or in Revoice Pro. Alternatively the APT Process Control Blocks can be placed so they do not include or submit the silence to the APT process. Revoice Pro contains specific mechanisms for "ignoring" digital or low level silent areas of waveforms which often can be used sucessfully. Sometimes, an audio file that is dragged into Revoice Pro has silence for many seconds before the real audio signal starts. If the Guide and Dub have roughly the same amount of silence in both files before the audio starts, then if the APT Process Control Blocks both start at the start of the silence, it is likely to work. If the result is not right, however, it might be best to move the starts of the both APT Guide and Dub Process Control blocks to start closer to the start of the actual audio signals. If there are different amounts of silence at the start of each, make sure the Guide and Dub Process Control Blocks have roughly the same amount of silence before the actually audio starts. There are three critical settings you should consider in this situation. Set the Guide and Dub Process Control Blocks to start a little (around 0.25 seconds is recommended) before the first similar audio that is to be aligned. In the APT Control Panel, use the Max Shift slider control (shown right) to reduce the maximum movement of the audio to around 0.07 to 0.10 seconds (if the audio is similar). Turn OFF the "Soft Limiting for Shift" switch. See image at right. If the audio still does not quite align correctly, try also setting the APT Alignment control to "Lowest Flexibility", as shown right. New in Revoice Pro 4 is an APT Preset named "Gaps in Dub Slightly Loose Time & Pitch" which can be selected to change the APT settings described in (2) and (3) above. We show an example of using these principles with the audio in the image below. In Track 2 (the Dub) there are individual words cut out of a different take of what the singer sang in Track 1 (the Guide) and digital silence fills the gaps between the cut words in Track 2. When the time and pitch of the Dub track is correctly aligned to the Guide - the "cut out" words will add emphasis to the lead vocal. Pay special attention to the fact that the first "cutout" word in the Dub starts a few seconds after the Guide signal starts. Also note the Dub is correctly positioned in time so it already loosely aligns correctly with the Guide as it is. So the audio blocks with words do not need to be moved very much, just tightened a bit more in time and, (optionally) pitch. You should position the start of the Dub APT block to just before the first word in the Dub, and also position the Guide APT block at approximately the same time position in the Guide, as shown in the image right. 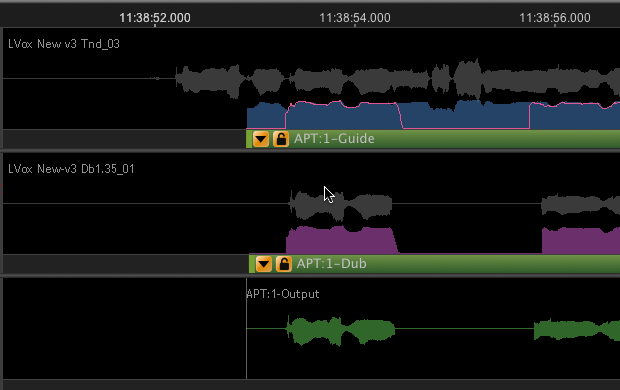 When this is done correctly, you can see in the Output track above (in green) that the first Output word remains roughly in place with the Dub audio, but the detailed shape now looks more like the corresponding Guide waveform. If you have set the Max Shift in the APT Control Panel setting to around 0.07 sec. to 0.10 sec., then after processing the audio, the Output (i.e. the aligned Dub) should be aligned with the Guide, which would then look something like the example below. It is clear that the Dub energy (shown in the yellow trace over the blue pattern in Track 1) is matching with corresponding energy in the Guide and, therefore, the Output waveforms are all in the right positions.